Time and again the Psalms show that the sanctuary plays a significant part in the relationship between believers and God. Well known is the firm conviction David expressed at the end of Psalm 23 that he “will dwell in the house of the Lord forever” ( vs. 6 , NKJV). David’s foremost wish in Psalm 27 was to be in the presence of Yahweh, a presence which was best experienced in the sanctuary. In order to show how much he cherished the sanctuary, David used the full range of expressions to refer to it, calling it the house of the Lord, temple, tabernacle, and tent. It is there that one can meditate and “behold the beauty of the Lord” (Ps. 27:4, NKJV). 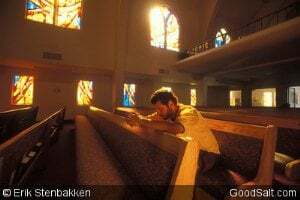 The activities of God in the sanctuary illustrate some crucial points: He keeps the worshiper safe and hides him in His sanctuary, even in tough times (Ps. 27:5). God provides secure refuge and assures peace of mind for all who come into His presence. These expressions connect the beauty of God to what He does for His people. In addition, the sanctuary service with its symbolic significance shows the goodness and justice of God. The ultimate object of David’s deepest desire was not only simply to be in the sanctuary, but for Yahweh to be present with him. That is why David resolves to “seek” God (Ps. 27:4, 8). Read Psalm 73:1–17. Which insights did Asaph get after entering the sanctuary? In Psalm 73 , Asaph addressed the problem of suffering. He could not understand the apparent success of the wicked ( vss. 4-12 ) while the faithful were afflicted. He himself almost slipped ( vss. 1-3 ), but going into the sanctuary made the difference for him ( vss. 13-17 ). There Asaph could see the same power and glory of God that David mentions in Psalm 63:2 and recognize that the present conditions will one day change and justice will be done. He could reflect anew on the truth and receive reaffirmation that in the end the wicked are on slippery ground (Ps. 73:18–20) and the faithful are secure ( vss. 21-28 ). For those who seek God, the sanctuary becomes a place of confidence, a stronghold of life, where God will set them “high upon a rock” (Ps. 27:5, NKJV). From the truth that the sanctuary service teaches, we can indeed learn to trust in the goodness and the justice of God. We are the Temple of the Holy Ghost (1 Cor 6:19). Did the Word say that God does not dwell in temples made with hands, but in........? On the other side, David says God is our dwelling place in all generations (Ps 90); and we dwell in the secret place of the Most High (Ps 91). Jesus Christ said it several times, and confirmed in prayer: He in us, and we in Him (John 13-17). Structures on earth provide shelter in our current condition here; but Sea of Glass in Heaven, and gatherings of the countless multitude in the New Jerusalem will require no structures. We will be there because He lives in us, and we live in Him. And He will be the Light, day and night. The place of worship is the solution to life’s problems. Like what is happening these days, all countries are talking of austerity measures - the churches are filling to the brim!!! I think that a "place of worship" is as often a problem as it is a solution, even though people look to places of worship as some sort of refuge. I believe that David was writing about the sanctuary as symbolic of the presence and activity of the Creator God. Only He is the solution to all of life's problems. The sanctuary really shows Alpha and Omega......He is all, He is our all and is in all. No wonder the new testament says"Looking unto Jesus the Author and the Finisher of our Faith.......the sanctuary has it all. What a full bouquet of our Salvation/Redemption story! It is good to trust in God, for he is our strength, our hope, our refuge and salvation. I had a conversation with my car mechanic yesterday. I knew that he was going through a difficult time in his life. His wife had left him, took the children and all the appliances and left him with an empty house. On top of everything, she is asking for so much child support that he can't meet his personal living expenses. He is so frustrated with everything and doesn't understand how the legal system has supported and enforced his wife's evil plot of revenge. I told him that sometime, everything we have will be taken away, without the possibility of getting them back. The answer is not in revenge nor in alcohol and tobacco or any other drugs. The solution is to return to the basics. What we learned from childhood is found in Matt 6:20 which says, "But lay up for yourselves treasures in heaven,...". This lesson teaches that investing in the kingdom of God is a sure winner. Nobody can take that away from us. Those who are prospering at our expense may be smiling and laughing now, but when we look into the sanctuary, we look into the future. We can see that all of our troubles will soon be over. Through our faith in the heavenly legal system, we can have peace of mind. Hello every one, Gods Blessings. I first want to give God Praise and thanks for todays blessings, for he woke us up this morning, Amen. What an awsome and loving God we serve, we are not deserving, of such love, that he has left us. It was not only Calvery, that he gave us , He's also left us the Santuary, Praise God. Amen. We are not deserving to be called his children, but because of his great love for us, he, "God", also allows us to call him Abba Father. His gifs to us is mighty, no gifts that our earthly fathers can ever give. Thank You Jesus. Only our heavenly Father, who gave to us a copy of his Santuary to show us more and more, of his love, and the ways in how we can stay connected to him. Jesus tells us to trust in no man, but he did not leave us with out a place to come to when life give us troubles and trials, we don't have to go to a confession box, and tell confession to man. Amen. God wants us to come to him. He said that he is a jealous God, and that we cannot serve two masters at one time, him or another, So let's keep on using the Santuary to the best of our ability. Until he comes to meet us in the skys. Praise God. We have a place for eternal rest. Let's keep doing his will. The innocent and sinless lamb carries the sins of the sinful man, and the lamb is slain, while the sinful man lives on, the sinner escapes death as the proxy dies in his stead then Lefevre says..Oh! The unspeakable greatness of that exchange..the sinless one is condemned and he who is guilty goes free, LIFE dies and he who knew nothing but confusion of face is clothed with glory........."surely, thy ways oh! Lord are in the sanctuary"
Asaph, the psalmist, saw the ultimate end of the wicked in the sacrificial system. The lamb that trades places with the sinner becomes the sinner. He dies in the sinners stead. The sacrificial offering is then placed on the altar and burned. "But the wicked shall perish, and the enemies of the LORD shall be as the fat of lambs: they shall consume; into smoke shall they consume away. "Ps 37:20 While this is not a pleasant truth it is reality. The sanctuary shows the way to God and also shows the results of the rejection of Him. I need your help am abit confused about the two lambs offered for sacrifice 1.was offered to God 2.the other was to act as a scape goat.what was done to the 2nd one was it slaughtered or it was left free since our sins were substituted to it?please explain in detail. The first goat was used for the cleansing of the sanctuary. After atonement had been completed, that is, the record of sin which was in the sanctuary had been blotted out, then the High priest came and confessed all the sins on the scapegoat and led it by the hand of a strong man into an uninhabited wilderness Lev 16:20-22. This represents how after Christ will have finished the work of atonement will place the sins of the world on satan who is rightly responsible. He will be left in a desolate world for a thousand years when all the saints will be in heaven and all the wicked dead. After a thousand years then he (satan) together with all the wicked will be destroyed with fire. Thanks, Charles. What I find interesting is that the Bible says (Lev 17:20,) "When he finishes atoning for the holy place and the tent of meeting ..." Then Aaron was to lay his hands on the live goat, representing Azazel, or Satan. As you have mentioned, atonement was finished before the high priest laid his hands on the live goat. Christ, represented by the goat that was sacrificed, finished the atonement for us. Because of the work of Christ, the righteous are clothes in His righteousness. It seems to me that the act of confessing the sins of the righteous over the head of Azazel represents the final judgment of Satan. He is held responsible for all the sins he caused the righteous to commit. I believe David learned the full and complete meaning of the sanctuary service. This is the complete typology of the true plan of redemption and the final tragedy of Satan and all the wicked ones. The Day of Atonement revealed this final act of God in extinguishing Satan and Sin forever and the manifestation of the blessed hope of the New Heaven and the New Earth. The goat that was selected for the Lord on the day of Atonement was sacrifice as to confirmed God's acception of all the yearly sacrifices represented by the ashes taken by the high priest into the Most Holy of Holy. The high priest then place all the ashes on the scape goat and the chosen men will take that scape goat far into the wilderness where this goat will never be able to find its way back to the camp. This final yearly service represent what will take place at the end of the 1000 yrs reign of all the Saints and Jesus in Heaven in the New Jerusalem. I believe this knowledge of the Sanctuary is what David saw and understood that brought him the blessed hope for God's followers and revealed the final tragedy of the wicked. Thanks be to God for the Plan of salvation that would not be discouraged and we will never fully comprehend until we meet Him face to face. By faith we behold His love and mercy and accept Him at His Word. Cheers!!! Could someone please clarify for me what happens after the second coming? The righteous are taken up to heaven, the others are left on earth, do they die at that point or are they left to be on earth with satan? After the millenium when the righteous come back to the earth made new do the unrighteous came back to life to be judged and then burned? I am beginning to understand some of the purpose of the sanctuary but it seems like a lot to get my head around! So the living wicked will hide their faces because seeing Jesus’ glory is literally lethal to them: “And then shall that Wicked be revealed, whom the Lord shall consume with the spirit of his mouth, and shall destroy with the brightness of his coming” 2 Thessalonians 2:8. When this attack on New Jerusalem takes place, the wicked are destroyed by fire (Revelations 20:5-15). So, Jesus comes, the righteous go to heaven with Him for 1000 years. The unrighteous die at Christ’s second coming and are resurrected after the millennium only to die the “second death.” That “second death” is what constitutes “hell.” It is eternal death. Please explain those who died in Christ do they wake up first when Jesus comes in the clouds and then the now living in Christ are also gathered in the clouds. now what about those who died wicked when Christ comes second time - does their grave open to witness Christ second coming is true and than they sleep again and when do they wake up again ? At the Second Coming of Jesus, there will be the living Saints that were sealed before the seven last plagues fell, and the wicked who servived through the 7 last plagues. These wicked ones will be destroyed by the brightness of His coming and they and the wicked ones in the graves will not be alive agin until the second resurrection at the end of the thousand year reign in heaven of Jesus and all the Saints. The only Wicked ones that will be resurrected at the Second Coming of Jesus will be of those who crucified Jesus, but they will be resurrected just to witness the Christ Jesus whom they crucified and return back to their graves. Now on the other hand, the dead in Christ will be raised first, and the Saints that are alive and remain from those 7 last plagues will be changed and caught up with them in the clouds to meet the Lord in the air and so they shall be with Jesus in heaven in the New Jerusalem for a 1000 yrs (Millenium). This earth will be left in ruin from the the aftermath of those 7 last plagues. Picture the condition of this earth and all the big cities from the effect of that mighty earthquake that is so powerful, all islands will disappeared. The ocean and all the living creatures in it will be dead and stunk from that plague that turn the water into blood. This is why the Bible refer to this earth as the Bottomless Pit. Satan and his angels will be the only ones alive on earth during the 1000 yrs reign. God will send an Angel and bound Satan in and on this planet for a 1000 years and there will be no soul on earth to be tempted. Now after the thousand years are over, John who wrote the Book of Revelation saw the New Jerusalem, that great city coming out of heaven from God with Jesus and all the Saints in it, and the Second Resurrection takes place where God will raised up all the wicked unsaved Ones. At this time God will loosen Satan for a short time and Satan will attempt to deceived the unsaved ones in his final attempt to seize the New Jerusalem with Jesus and all the Saints. And as they go up to attack the New Jerusalem, God will rain down fire and brimstone and consum them up forevermore and no longer be anymore existence of them and SIN on this planet or anywhere in God's perfect Universe. The fire that consumes satan his angels and all the wicked will also purified this planet and God will set up that beautiful city, the New Jerusalem on this renewed earth and we will enjoy its marvelous beauty throughout eternity with God, in this New Earth and the New Heaven that is promised to us. The Bible said, "It has not yet entered in the minds of man what God have in store for those who love Him." This is the hope of Glory and the promise of Jesus; "Let not your hearts be troubled, ye believe in God believe also in Me. In my Father's house are many Mansions, and if there were not so I would have not told you. I go to prepare a place for you and I will come back to receive you unto Me, so where I am ye maybe also. What a promise. God never fail any of His promises for He is true to all His promises. The moment we surrender ourselves to God and choose Jesus to be Lord and Saviour of our lives, Eternal Life is guarantee to us at that moment. This is the power of the Gospel in Jesus. With the power of choice we have, we can keep the gift of Eternal life from that point on. We can also forfeited the gift of Eternal life when we choose to disobey God's Will after. Jane, Knowing the love that God has manifested and what this world offers i would be a fool totally out of my mind to forfeit God's gift of Eternal Life. Cheers my friend!!! I love the powerful prayer of Solomon 1 Kings 8 He knew that the Lord would be contained in the sanctuary and verse 41 he prayed for the foreigner (me) who would approach the sanctuary . Thank you Jay and Seig for your helpful insights into this amazing story of our salvation. Our God is so awesome and I pray that I will be there for that wonderful day - all made possible because of Jesus death, God's ultimate sacrifice. I also pray for my family and others to accept this wonderful gift and share in the glory of the earth made new. Jane French, It was a blessing for me to share what I've been blessed with by God about His marvelous plan of redemption that will restored us back into His presence where we will spend Eternal Life with Him forevermore. I maintain a daily union with Christ and I strongly believe this will refresh our faith daily in God and the Blessed Hope. All the glory be to God and again thank you for sharing your faith with me. Cheers!! !